(PhysOrg.com) -- Amino acids are markers for potential life since they are the building blocks of proteins. Now scientists in California have for the first time found the shock wave created when a comet has a glancing blow with a planet can deform molecules inside the comet, break bonds and create new ones, forming new molecules, including an amino acid complex. Researchers at the Lawrence Livermore National Laboratory in Livermore, California used about one million computer hours on the laboratory’s Atlas computer cluster to simulate what chemical events might occur in a single ice grain inside a comet striking a planet with a glancing blow. They were looking in particular to see if amino acids might be formed. 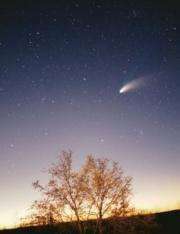 There are a number of theories on how amino acids were first formed on Earth, including the interactions of lightning or UV radiation with the primordial “soup” of simple molecules, and the presence of amino acids on interstellar dust, but Nils Goldman and his team thought amino acids might also be produced by the shock compression wave formed when a comet hits a planet. The sudden jolt produces a compression wave that passes through the comet faster than the speed of sound, and this could deform and break up molecules inside it, which would then form other molecules. The computer simulation began with a grain of ice containing a mix of 210 molecules commonly used by researchers as representative of ice inside comets. The molecules include ammonia, carbon monoxide, carbon dioxide, methanol, and water. They then simulated what would happen when the comet containing the ice grain and moving at 29 km per second hit the Earth side-on (since a head-on collision would most likely destroy the comet). Their computer model used density functional theory simulations and a quantum mechanical treatment of the electrons in the molecules, such that if electrons in the model came close enough to electrons in other atoms a bond would be created. They first modeled a weak shock wave with a pressure of 10 gigapascals, which produced a temperature of 700 kelvin. In this model the ice grain was compressed by 40% and formed new C-N bonds, producing molecules such as carbamide (urea - CH4N2O), which is a natural molecule formed in the liver from ammonia produced by the de-amination of amino acids. Its formation suggested that processes creating amino acids were also possible. Goldman said that under these reactive conditions if one sort of molecule with a C-N bond is formed, it is easy to imagine more carbons adding to it and forming more complex molecules such as amino acids. Goldman and colleagues then simulated higher pressure and temperature collisions, and found that when the pressure was 47 gigapascals and the temperature was 3,141 kelvin for the first 20 picoseconds (20 trillionths of a second) after impact, large and complex molecules containing C-N bonds were formed. Further molecules were formed in the relaxation period after the shock compression wave, during which the compressed comet cools and expands. After 50 picoseconds of relaxation there were five C-N molecule types, including carbamide, hydrogen cyanide (HCN), and what appeared to be the amino acid glycine (C2H4NO2), but with a carbon dioxide molecule attached. Hydronium ions (H3O+) were also formed. Goldman said he was certain glycine would be formed within the first microsecond through a spontaneous reaction of the glycine/CO2 complex with a hydronium ion to form glycine, water and carbon dioxide, but the simulation is too complex to run long enough to see this. Goldman presented his findings last week at the Spring 2010 meeting of the American Chemical Society in San Francisco, California. Could salt crusts be key ingredient in cooking up prebiotic molecules? Very interesting work. The next question is whether such molecules could survive the high temperature and impact of falling to the planet's surface. My thoughts exactly Dan .... amino acids are very weak and prone to degradation, which could impede anything to do with forming extremely highly complex, self-replicating chains which ought to be a precursor to life. I recommend reading "The Mystery of Life's Origin" by Charles B. Thaxton et co. --- a proper discussion on how life could form and why its virtually impossible to have come from a spontaneous and accidental linking of inorganic molecules. Their bonds are, but not the molecules themselves. @iknow: have you read Stephen Meyers newest book? Tell us how awesomely awesome it is, and how he totally disproves, using mathematical factuals, abiogenesis.